The Old Reel Collectors Association, Inc. is a rapidly growing group of over 700 fishing reel collectors from all over the US, and eight foreign countries. ORCA memberships run for a calendar year. Anyone joining at any time of the year will receive all issues of the Reel News for that calendar year. Welcome to the online home of the Old Reel Collectors Association, Inc. On these pages you will find information about our organization and what we offer to people who are interested in learning more about old fishing reels. 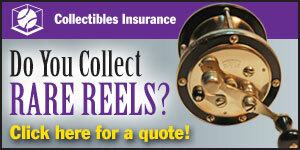 ORCA is The Old Reel Collectors Association, Inc., which is a non-profit, educational corporation. We are a loose knit group of fishing reel collectors who are joined by our interest in old fishing reels and their history. ORCA welcomes new members and anyone else that is interested in fishing reels made all over the world. "The purpose of the Old Reel Collector’s Association, Inc. is education through the collection and distribution of historical and technical data regarding fishing reels, their development and their inventors and manufacturers from the earliest times through the present day. In order to enhance the knowledge of these subjects, the collection and preservation of examples of post production reels is to be encouraged for the benefit of present and future generations…"
To learn more about ORCA, please step inside and read about us, or click on any of the links provided on this page. You may also join our Reel Talk Forum to ask questions about your old fishing tackle. This is a discussion page which is made available to the general public. We hope you find this as a place to gather, learn about old reels, perhaps get answers to some serious reel questions, or get the opinions of some veteran collectors. The catalog for the important auction at the 2019 ORCA Annual Convention has been published. The link to the catalog file is on the page for the Tulsa Convention. © 2019 Old Reel Collectors Association, Inc. All rights reserved.